Enjoy gorgeous Views at this adorable Waterfront Studio that sleeps 2 & has a Pool! Our Studio Suites have a Queen Size Bed and a spacious Full Bath with Tub/Shower Combo. Your Room will also have a small table with chairs, a coffee maker, and a mini refrigerator. Rooms accommodate two guests. 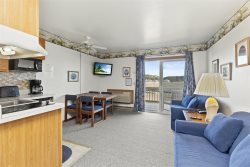 Relax in the AC and enjoy Flat Screen Cable TV and Free WiFi after a fun-filled day on the Beach, or slip out to the refreshing Pool to cool off.